This year’s 13th edition of the Internet Governance Forum is hosted by the French government as part of Paris Digital Week. The annual gathering, held under the theme “Internet of Trust,” is an important space for Access Now to engage with both state and non-state actors to ensure users’ rights are prioritized. Access Now’s Digital Security Helpline staff will hold a Digital Security Clinic throughout the conference to help any participant with questions or concerns about digital security practices, needs, and capacity. We assist civil society globally, and can provide one-on-one consultations in several languages, or set up future trainings to enable your organization to audit and harden its digital security infrastructure. 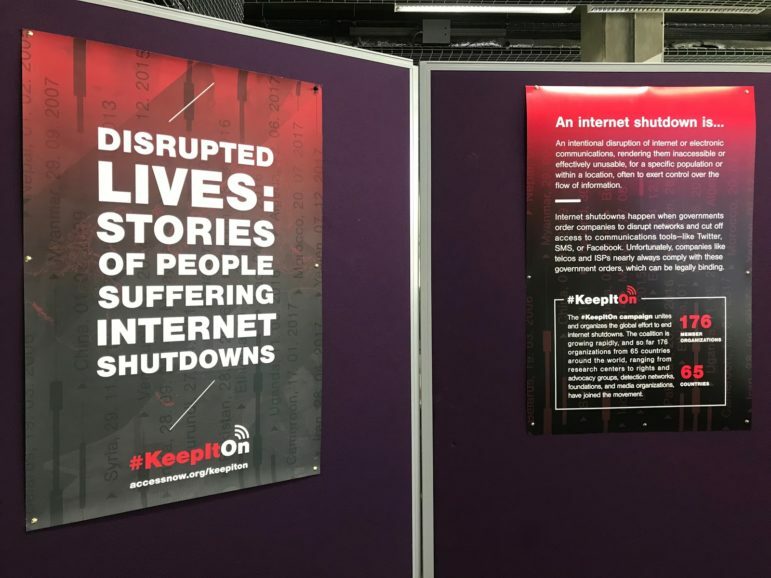 IGF participants will also have the opportunity to visit our exhibition Disrupted Lives: Stories of people suffering internet shutdowns, which draws from the testimonies we have collected as part of the #KeepItOn Shutdown Stories Project to show the consequences of intentional, government-ordered internet shutdowns and network disruptions in people’s lives. Access Now Digital Security Helpline staff will be hosting a Digital Security Clinic on the UNESCO premises. At the same location, you can also visit the “Disrupted Lives” exhibition. IGF 2018 WS #427 AI will solve all problems. But can it?